You probably know this by now, but the first Red Dead Redemption is about a former outlaw named John Marston being forced by the government to hunt down the remaining members of his old gang, in exchange for returning John’s wife and son to him. All of this takes place in 1911, several years after the gang disbanded, and during the story we also learn John left the gang after their leader, Dutch van der Linde (Dutch is presumably a nickname, that or his parents were very unimaginative), abandoned him and left him for dead during an unspecified robbery. While you can play John in RDR1 as a dastardly villain in the open world portion of the game, the story portrays him quite firmly as a decent man trying to leave his violent past behind so I’ve always played him that way as well, helping people out and stopping crimes and such. 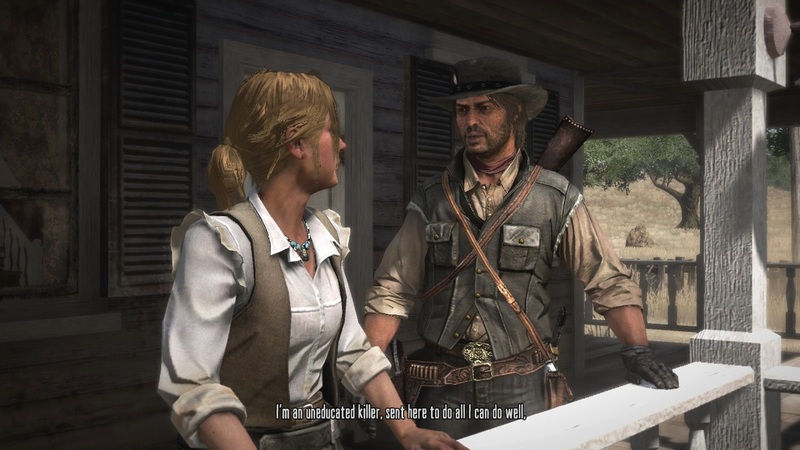 Marston talking to Bonnie MacFarlane in RDR1. Despite some critics questioning John’s badass credentials due to his frequent violent threats towards story NPCs he never follows up on, John is an instantly likable and memorable protagonist whose plight is easy to sympathize with and whose dry wit really helps in the numerous plot conversations with various morons. A major part of John’s charm comes from the voice performance by Rob Wiethoff, without whom John wouldn’t come across nearly as well as he does. His voice is suitably rough for the role, but never once sounds like a stereotypical cowboy character. Red Dead Redemption 2 rewinds time back to 1899, to the later days of the Van der Linde (which, by the way, uses the Americanized pronunciation “Vanderlind”) gang. This means we get to see John as the young outlaw he used to be, participating in bank robberies and train heists and all that fun stuff you’d expect, but he is not the playable character. Instead, that honor falls on a fellow named Arthur Morgan, a new character who is basically one of Dutch’s top lieutenants and, alongside Dutch himself and an older gentleman named Hosea Matthews, founded the whole gang in the first place. On a side note, I keep accidentally calling him Arthur Brown, which also explains the title of the previous article. Unlike John at the start of RDR1, Arthur makes no effort to be a decent person. This makes sense, of course, since at this point he is a hardened outlaw whose day job mainly involves robbing and/or shooting people. Arthur also isn’t completely without morals, as he doesn’t partake in unnecessary killing (unless the player decides to do so) or take any personal enjoyment from violent acts. I will go right ahead and admit I didn’t like Arthur at all when he was first introduced in the trailers, and things didn’t improve when I heard him talk for the first time. When he first appears, Arthur looks like a generic Marlboro Man type cowboy (his appearance can thankfully be customized with clothing, hair, and beard options) and sounds like a person putting on an overly gruff cowboy voice with that “howdy, pardner” southern twang. My thought process was that since Marston is right there, why not just have him as the protagonist? Even the worry about Rob Wiethoff not reprising his role due to his decision to quit voice acting to live on a farm with his family (an example of life imitating art, if I ever saw one) turned out to be unnecessary, because he’s back and sounds just as good as before. For the first few hours, I was actually thinking “huh, they got a pretty decent replacement actor for John”, but then I found out it was actually Wiethoff and the game’s credits eventually confirmed it. In any case, I eventually warmed up to Arthur as a character. He doesn’t seem to have much depth at first, but the writing and Roger Clark‘s voice performance (which is also far more nuanced than it seems at first) manage to humanize him to an extent that genuinely surprised me, and to make me care about how his personal story turns out. Even without venturing to spoiler territory (that’ll be next time), I can see now why Rockstar gave us this new character instead of having us play as John again. After all, we already know that John leaves the gang and goes off to live on a farm with his wife and son after Dutch screws him over, so just telling us that story wouldn’t be very exciting. With Arthur as the protagonist, the writers were able to show us something completely different and take the story into unexpected directions that would not be possible if the game was all about John again. 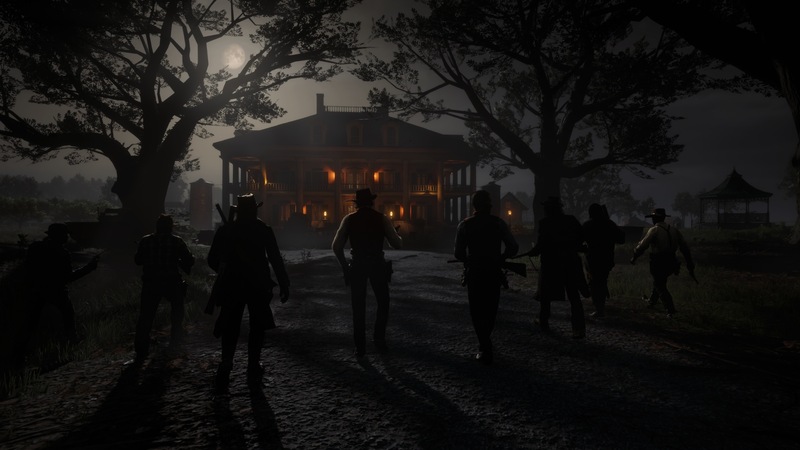 Now, if you’re familiar with RDR1, you know Arthur is never mentioned in that game, and that sounds a bit ominous considering RDR1 is largely about hunting down the remaining ex-members of Dutch’s gang. However, we don’t know why he’s not around in 1911 and consequently why John isn’t forced to hunt him down along with Bill Williamson, Javier Escuella, and Dutch himself. The easiest and most obvious assumption to make is that Arthur simply died at some point between 1899 and 1911, but who is to say that is the case? And even if it were, how and when did it happen? Did he stay loyal to Dutch or go off to do his own thing, like John? Did he perhaps get gunned down trying to protect his friends? How does the notorious Blackwater Massacre of 1899 factor into things? Well, the Blackwater Massacre is in fact where the story begins, or more accurately the aftermath of the Massacre is where we start off and we don’t see the event itself. The van der Linde gang is on the run from the Pinkertons after a riverboat heist in the town of Blackwater went horribly wrong and caused the whole mess, and the story of Red Dead Redemption 2 follows the gang as they try to stay ahead of their pursuers while also attempting to make enough money to escape America, preferably to a tropical island somewhere. Obviously, we know from RDR1 that this plan doesn’t work out, so what happened? Dutch’s gang isn’t just a bunch of gun-slinging outlaws riding across the west. It’s an entire wagon caravan of people, including women and children (well, John’s son Jack is the only child there, but still), following Dutch and ready to give their lives for him because he helped them out of bad spots and practically raised some of them from childhood. Dutch sees himself as something of a Robin Hood figure whose moral code is all about stealing from those who have too much, and helping those who need help, and in his best moments he is such a charismatic leader that it is easy to see why all these people follow Dutch and look up to him. However, the events of Blackwater have clearly taken their toll on the man — and things are not helped by the presence of a detestable scumbag named Micah Bell. Micah joined the gang about six months before the beginning of the game, and by this point he has become one of Dutch’s most trusted men. 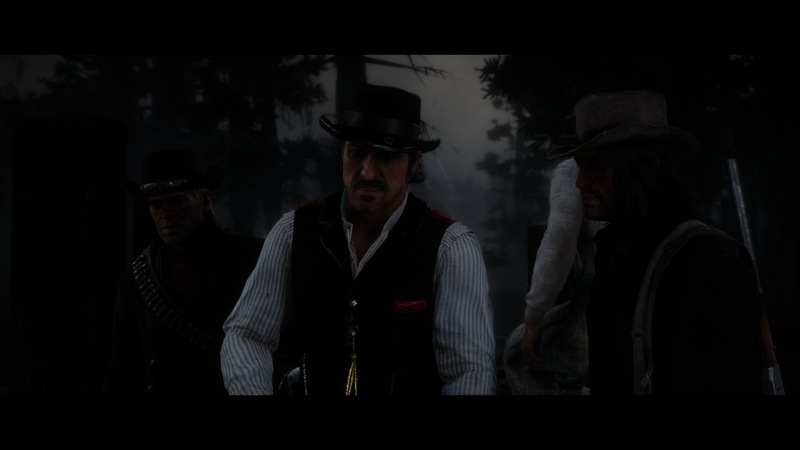 In practice, Micah is Dutch’s Grima Wormtongue, constantly in the boss’ ear and handing out terrible advice that Arthur and Hosea strongly oppose from the start due to how reckless and idiotic it is. Arthur and Micah are always at each other’s throats, and Micah is so incredibly unlikable that even if he’s not doing anything wrong you kind of want him to so you’d have an excuse to put a bullet or twelve in his head. After GTA V, it’s refreshing to see a Rockstar game where the character eliciting this response from me is an antagonist instead of a playable character! That brings us to the writing, characterization and tone in general. After all the unrelenting cynicism, hamfisted attempts at satire, and the terrible assholes you had to play as in GTA V, it is such a joy to see that Rockstar hasn’t doubled down on going in that direction. Yes, the world of Red Dead Redemption 2 can still be dark, bleak, and full of all kinds of horrible people, but that doesn’t mean everything is bad. There are genuinely affecting moments here and the vibe is often surprisingly positive (at least if you’re playing as an honorable outlaw like I did; apparently things can get a bit depressing if you go full black hat), and the characters you are meant to root for are actually likable despite the fact many of them are supposed to be criminals. Every member of the Van der Linde gang is memorable and well written, and I ended up caring about even the most minor characters in my camp because the writing gave me a reason to care. I honestly did not expect the writing and characterization to be this effective, especially after GTA V told me caring about things is lame and stupid. 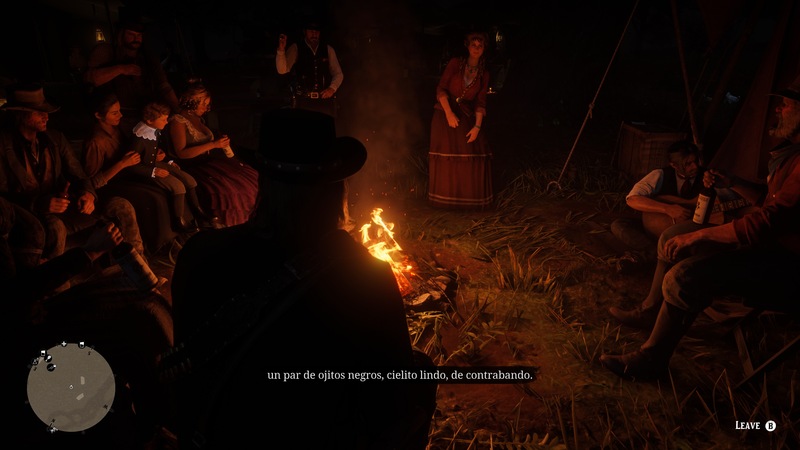 Out of the returning characters from RDR1, I think Javier Escuella (on the right, with the guitar) benefits the most from the added characterization, in part because he didn’t get any in RDR1 beyond “the Mexican guy who hangs out with Bill Williamson”. In RDR2, we find out Javier can be a pretty decent and affable guy who enjoys a bit of fishing and sings like an angel. Here he’s delighting the rest of the gang by performing Cielito Lindo, a famous traditional Mexican song. Of course, nothing is perfect and the story has some issues, but I’ll touch upon those in the upcoming megaspoiler writeup. That said, I don’t think I’m spoiling much of anything here by mentioning that a particular chapter in the story is such a departure from the rest that it almost gave me whiplash, and once it was over I wasn’t sure if I hadn’t just imagined the whole thing. If you’ve played through RDR2, you know which part I mean. A couple of missteps aside, I feel this might be the strongest story Rockstar has created for any of their open world games, and I’m glad to see they haven’t lost their touch after all. That concludes the non-spoilery portion of this review. In the next part, I will take a closer look at the game’s story and Arthur himself, and there WILL be spoilers for absolutely everything that can be spoiled.